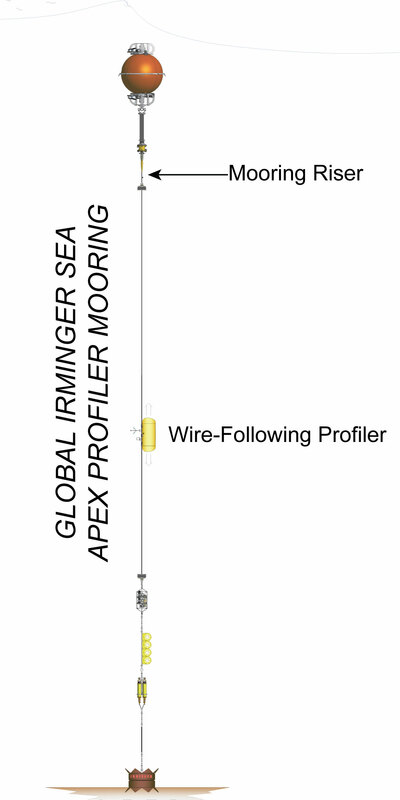 The Irminger Sea Apex Profiler Mooring is co-located with Apex Surface Mooring. Additionally, at the Argentine Basin site are two identical Flanking Subsurface that make up the equidistant sides of a triangle of Moorings (20 km) from the co-located Profiler and Surface Moorings. The Profiler Mooring is located in 2,800 meters of water southeast of Greenland in the North Atlantic. The triangular configuration moorings provide unique spatial array through which instruments fixed to moorings continuously collect data through time and gliders sample the area between the moorings. The Irminger Sea site is one of four high latitude open ocean locations in the OOI that provide observations to gain better insight into global ocean circulation and climate. 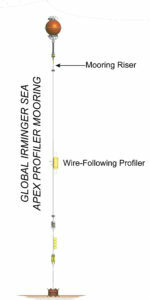 The Irminger Sea Apex Profiler Mooring contains one Wire-Following Profiler that houses instrumentation. The Wire-Following Profiler moves through the water column along the mooring riser, continuously sampling ocean characteristics at a high vertical resolution over a specified depth interval (240-2,400 meters).